July 2, 2010 - Gulfstream Aerospace Corp. announced today that the third and final Gulfstream G250 test aircraft has joined the flight-test program. Gulfstream, a wholly owned subsidiary of General Dynamics, designed and built the super mid-size business jet in collaboration with Israel Aerospace Industries (IAI) in Tel Aviv, Israel. The third aircraft completed its first flight on June 28, taking off from Ben Gurion airport at 10:30 a.m. local time. During the 2 hour, 56 minute flight, the aircraft reached a maximum speed of 250 knots and a top altitude of 20,000 feet (6,096 m). All three aircraft that are part of the 1,300-hour flight-test campaign have now entered the flight-test program, beginning with the first, S/N 2001, on Dec. 11, 2009. Each aircraft has been assigned a specific series of tests to perform, with S/N 2001 focused on in-flight performance and handling, S/N 2002 on avionics and S/N 2003 on systems functionality and reliability. ?It?s exciting to have all three test aircraft in the air,? said Pres Henne, senior vice president, Programs, Engineering and Test, Gulfstream. ?What?s even more exciting is the response we?re getting from the pilots. They?ve told us that the aircraft?s handling qualities are excellent, rivaling those of our large-cabin aircraft. That?s something we like to hear, because it means we hit the mark with our design. And we have our operators to thank for that, because they played a major role in creating this jet. This aircraft represents what they told us they wanted.? David Dagan, corporate vice president and general manager, Commercial Aircraft Group, IAI, said, ?What we?re witnessing today in the G250 flight-test campaign is the synergy of advanced engineering with skilled manufacturing and assembly. The hours of flight testing we are able to produce are exactly as we planned. The tests are executed exactly as we planned with the full completion of each test card, a true sign of the maturity of the design the teams brought forth.? The test aircraft have flown over 200 hours on more than 70 flights. S/N 2001 has reached its maximum speed of Mach 0.85 and altitude of 45,000 feet (13,500 m). The G250 made its longest test flight today with a duration of seven hours and one minute. The G250 offers the largest cabin and the longest range at the fastest speed in its class. Powered by twin Honeywell HTF7250G engines, the business jet is capable of traveling 3,400 nautical miles at Mach 0.80. Its initial cruise altitude is 41,000 feet (12,496 m). 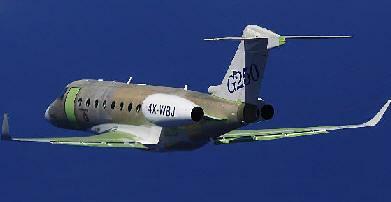 The first G250 rolled out of the IAI manufacturing facility in Tel Aviv under its own power on Oct. 6, 2009. It is on schedule for type certification in 2011. The aircraft will be completed at the Gulfstream Mid-Cabin Center of Excellence in Dallas.